The Express Document Tab program is a freeware. It is also the same when distributed with third party programs. Quickly switch between drawings in Autodesk® AutoCAD®. Left mouse button: When you click left button on the tab of the drawing, move to clicked drawing quickly. Mouse wheel button: Place the mouse over Tab, push the wheel moves to the left, and pull it moves to the right. Ctrl + Tab: The Ctrl + Tab and Ctrl + Shift + Tab keys launch the Drawing dialog box and allow you to easily switch between drawings. 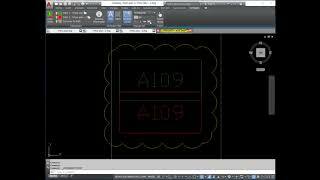 This is a menu function provided when typing 'Tab' key in AutoCAD drawing or click the right button in Tab. Open current tab only: Close all items except selected items. Save all drawings to another folder: Save all open drawings to another folder. Close all drawings without saving: Close all open drawings without saving them. 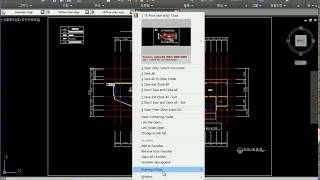 Save and close all drawings - Exit CAD: Save and close all open drawings and close CAD. Close all Drawings without saving - Exit CAD: Close all open drawings without saving and exit CAD. Open parent folder...: Open the folder location of the drawing at Windows Explorer. Open as link file...: Similar to the shortcut file in Windows, it is visible in Express Document Tab, but AutoCAD opens the drawing without opening it. Open as Link Folder...: Select a folder and open the drawing of the folder with a shortcut. Change to link tab: The open drawing changes to a shortcut. At this point, the drawing other than the active drawing is saved and closed. Favorites: Display the favorite icon in the tap item and click the mouse to open the drawing. Add to Favorites: Add selected items to favorites. Remove from Favorites: Deletes the selected items in 's favorites. Open all Favorites: Open all your favorite drawing of Tab. Add all open tabs: Add all items in Tab to your favorites list. Previously Opened Drawings: Displays previously opened drawings as submenu and opens or activates them when selected. Script...: Select an AutoCAD script file and run it sequentially on all open drawings. 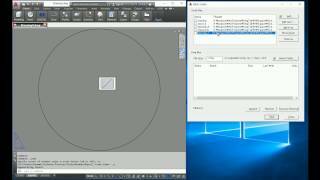 Batch script...: You can run a script against a large number of drawings without opening the drawing directly with the AutoCAD program. Preferences...: Launches a dialog box where you can set environment of Tab. Horizontal tile: Places the drawing horizontally when there are two selected drawings. Vertical tile: Places the drawing vertically when there are two selected drawings. Multi-monitor location: This feature allows you to switch AutoCAD programs directly when using more than one monitor (no menu is displayed when using a single monitor). Open current tab only: Closes all items other than the selected item. Save and close all drawings - Quit CAD: Save and close all open drawings and close CAD. Close all CAD drawings without saving - End CAD: Close all open drawings without saving and exit CAD. 저는 윈도우 레드스톤4를 사용하는데요. 얼마전에는 캐드 2017 3d map에서 아무리 해도 설치가 안됬습니다.그래서 개발자님 블로그에도 안된다고 글을올렸는데 아무런 답변이 없으시더군요.물론 저와 같은 현상인 분이 블로그에 글을올리셨더군요.그분 질문에는 답변이 있으시더군요. 답변이 없으셔서 포기하고 이번에 새로운 캐드를 설치하고 지금 다운받아 해보니 잘되는군요. 암튼 결과적으로 잘되니 기분좋습니다. 이런 좋은 프로그램 만들어주셔서 고맙습니다. 개발자님 수고가 많으십니다. 프로그램은 항상 잘 사용하고 있으며 감사드립니다. 이번에 autoCAD에서 autoCAD LT로 사용중인데 LT버전은 아직 호환이 안되는건가요? 끝없는 업데이트와 사용자들의 의견 하나 하나 세심하게 살피는 개발자님의 열정에 존경을 표합니다. 乃 캐드 사용 10년차~ 최고의 프로그램입니다. 개발자님 감사합니다. 좋은 평가 감사합니다. 즐거운 하루되세요. &#51339;&#51008; &#54217;&#44032; &#44048;&#49324;&#54633;&#45768;&#45796;. &#51600;&#44144;&#50868; &#54616;&#47336;&#46104;&#49464;&#50836;. When will iDwgTab be re-compiled for AutoCAD 2018. I can not do this magnificent application. Thank you. 모든도면 저장 기능이 안먹힙니다. ㅠㅠ 오토캐드 자체 문제인줄 알고 포맷하고 재설치 했는데도 안되네요,, 혹시 해결책이 있을까요?? 원격이라도 받고싶은 마음입니다. 감사합니다. 조금이나마 CAD 업무에 도움이 되길 바래왔는데, 잘 사용하시는 것 같아 보람이 있네요. 사용하시면서 문제를 발견하시면 언제든 연락주세요. 감사합니다. 사용중에 사소한 문제라도 발생되면 언제든 알려주세요. 이곳에서 뵙게되니 무척 반갑네요.^^ 항상 좋은 평가 주셔서 감사합니다. &#51060;&#44275;&#50640;&#49436; &#48473;&#44172;&#46104;&#45768; &#47924;&#52377; &#48152;&#44049;&#45348;&#50836;.^^&#13;&#10;&#54637;&#49345; &#51339;&#51008; &#54217;&#44032; &#51452;&#49492;&#49436; &#44048;&#49324;&#54633;&#45768;&#45796;. 다음 업데이트에는 영문 도움말을 준비해서 언어를 영어로 설정하고 올리겠습니다. 감사합니다. &#45796;&#51020; &#50629;&#45936;&#51060;&#53944;&#50640;&#45716; &#50689;&#47928; &#46020;&#50880;&#47568;&#51012; &#51456;&#48708;&#54644;&#49436; &#50616;&#50612;&#47484; &#50689;&#50612;&#47196; &#49444;&#51221;&#54616;&#44256; &#50732;&#47532;&#44192;&#49845;&#45768;&#45796;.&#13;&#10;&#44048;&#49324;&#54633;&#45768;&#45796;. What a amazing program! it has simple user interface but has powerful function. Also, it doesn't effect to program performance. I think AutoCAD has to be included this program basically.